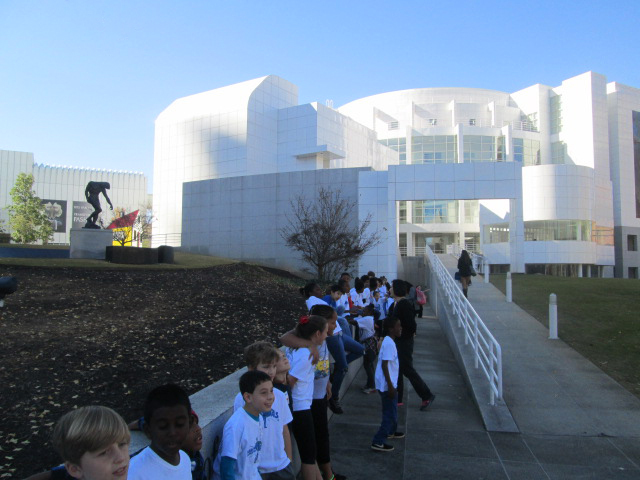 Third-graders headed into the High Museum of Art, Atlanta, GA. All photos © Andy Plemmons, used with permission. Collaboration between classroom teachers, special areas teachers and the librarian brings about some of the richest projects I’ve experienced. 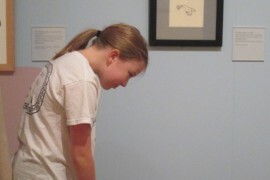 When the High Museum in Atlanta, Georgia, brought the exhibition Seriously Silly: The Art and Whimsy of Mo Willems, we knew as a school that we had to take advantage of this opportunity to create a collaborative project. However, you don’t have to visit an exhibition at a museum to do a project similar to ours. Using Mo Willems’ books and art as inspiration, we created a project for our third-grade students that incorporated reading, art analysis, illustration, writing and animation. Our project began in the library with the art teacher. When each class went to art, they met in the library for a collaborative lesson between the art teacher and me. We met as a whole group first to set the stage for the beginning of our project. The art teacher and I are both firm believers in tinkering at the beginning of a project, so tinkering was the main goal of this initial lesson. 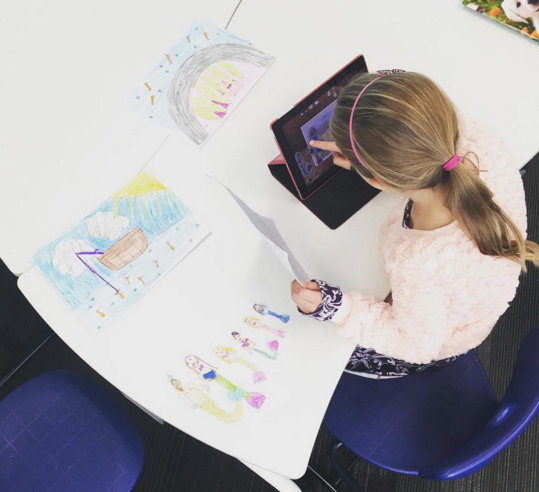 We wanted students to have a chance to explore the illustrations of Mo Willems as well as explore Puppet Pals, an animation app on the iPad. We encouraged students to press all the buttons as they used the technology, and we encouraged the students to look at the books of Mo Willems in a different way than they had before. We split students into two groups to rotate between a collection of Mo Willems books and the iPads with the free version of Puppet Pals. I pulled all of the Mo Willems books from our library collection and brought my own personal collection. I grouped them by series (Elephant & Piggie, Cat the Cat, Knuffle Bunny and The Pigeon) and by stand-alone books (Goldilocks and Three Dinosaurs, Leonardo the Terrible Monster, Edwina the Dinosaur Who Didn’t Know She Was Extinct, Naked Mole Rat Gets Dressed, and That is NOT a Good Idea!) and asked the students to keep them in those arrangements so that they could begin to notice patterns within a series or differences between series and stand-alone books. Most students were familiar with many of the books, so we didn’t want them to spend time reading just one or two books. Instead, we wanted them to spend the majority of their time looking at as many illustrations as possible and making observations. This didn’t come naturally for several students because they were drawn into the text and wanted to just sit and read the books. The art teacher and I both roamed among the students and modeled our own observations or asked questions that helped guide students to think about what they were seeing in an illustration. We asked things like, “What do you notice about the setting? What do you notice about the characters? How is the character feeling and how do you know? How does Mo Willems show movement in his illustrations?” As students moved between series, we asked “How is this series different from another series you looked at? Do you notice any similarities between these illustrations and other ones you’ve seen?” Students, of course, made amazing observations on their own, but we found that being a part of the exploration alongside them made the experience deeper by showing our students that we were observing and learning from the art in the same way they were. Students were introduced to the Puppet Pals app by being given the freedom to explore independently. At the second station, students mostly worked independently to explore the Puppet Pals app. This was the app we would use for the final product, but there was no expectation to think about the final product during this tinkering session. We simply wanted students to press every button within the app to see what they could discover about how the app worked. As they figured something out, they were welcome to share it with someone sitting near them. I’ve learned that I don’t need to spend a lot of time showing how to use a technology tool because students are perfectly capable of doing that on their own. The Puppet Pals app allows students to select up to 8 characters and 5 settings and record an animated video using those selections along with their recorded voice. Videos can then be exported to the camera roll and uploaded wherever you choose to share videos. Many students made multiple silly videos during their tinkering time, but in the process, they learned to do things such as switch scenes in a recording, change the size of a character, and move a character on or offstage. I briefly checked in with students during their tinkering time with the app to make sure they were on track. 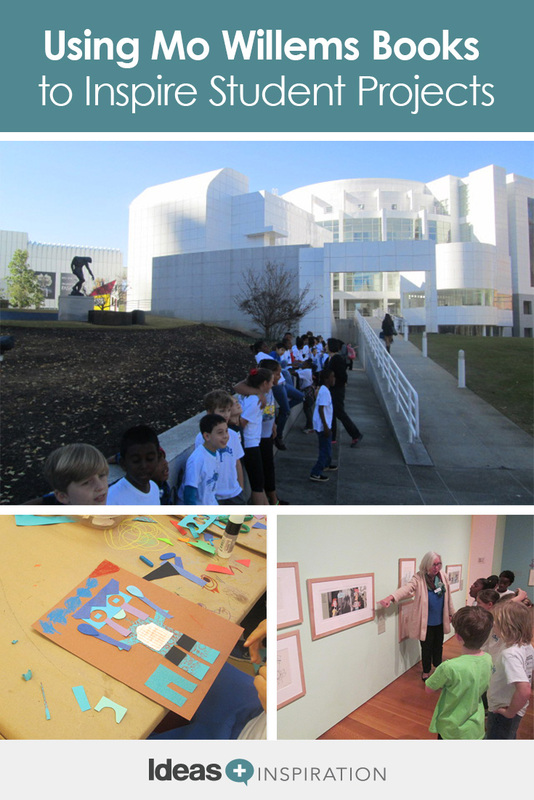 Our art teacher wrote a grant for the entire third grade to visit the Mo Willems exhibit at the High Museum of Art in Atlanta. Visiting the exhibit gave students two opportunities to learn, which you can adapt and use in your library without visiting a museum. For our first activity, we toured the exhibit with a docent. The exhibit was broken up similarly to how I had organized the books. Illustrations from a series were together while stand-alone books had their own space. 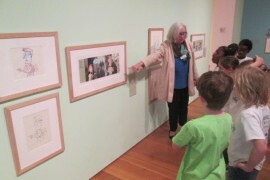 The docent stopped students in front of various illustrations and had them sit on the floor. She walked them through a series of questions or experiences. When we looked at The Pigeon illustrations, she wanted students to notice how Mo Willems showed character emotion through eye position, movement, and facial expressions. Students looked at an illustration and then stood up to mimic what they were seeing. I loved that students were seeing an actual illustration from Mo Willems and then interpreting it through their actions before trying to create something on their own. Rather than use the original artwork, you could select some illustrations from various Mo Willems books to replicate this experience. 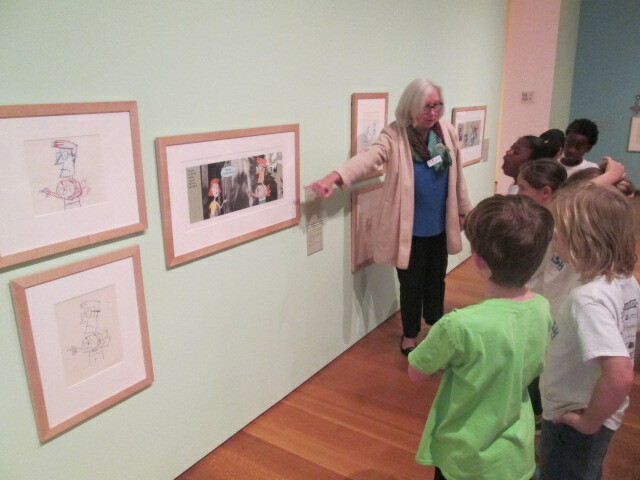 Students listen as a museum docent talks about the art of Mo Willems. 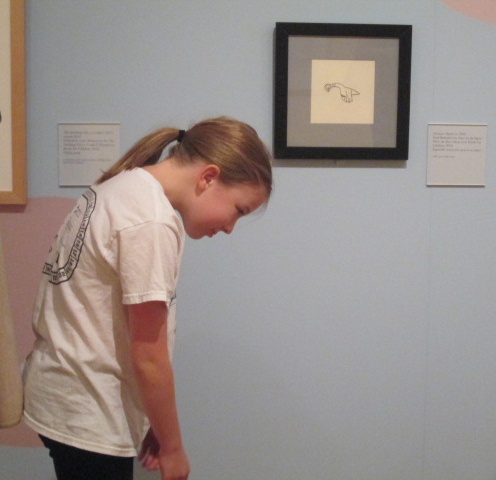 A student mimics the expression she sees in Mo Willems' art. Also in the exhibition, students were able to see the progression of a piece of art from the initial sketch to the final piece. Each version used a different color. This was a big benefit of seeing the exhibition in person because it’s not as easy to see the many drafts of a picture book within your school building, especially placed side by side in a frame. However, many illustrators freely share their process on their websites and through social media, so you can find examples of drafts even if they aren’t specifically from Mo Willems (for example, Eric Carle’s website has slideshows that feature his artistic process). For our students, seeing these examples from a published illustrator was a reminder of why we encourage them to create multiple drafts of art or writing before the final piece. It also informed our project process to be sure to include drafts of our work. Students used what they learned about illustration to create monsters with emotion. For the second activity during our trip, students visited an art workshop. The teacher read Leonardo, the Terrible Monster. Once again, the students were asked to pay close attention to the expressions on each monster’s face. They looked at eye position, mouth placement, and movement of arms and legs to determine each monster’s feelings. 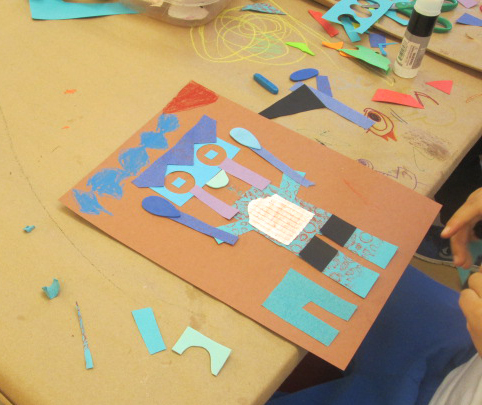 Next, students sat down at a table with lots of construction paper, markers, glue, scissors, and rubbing plates. There were no instructions or templates, but students were asked to create a monster. I loved that this was an opportunity to practice everything that we had been exploring both at school and at the museum. Students had seen many examples, but now they really needed to tinker to see how they could bring out the emotions of their characters. I watched as students created eyes on their characters and then placed the pupils in multiple positions to see how it changed the way their monsters looked. I saw many students do the same thing with the mouth position. Every single monster was unique because it came from each student’s own creativity rather than a pre-made pattern. Students were able to take their monsters back to school as a reminder of what we had learned as we moved into the next steps of our project. This is another lesson that could be replicated within your own space. At this point, we had a decision to make. We debated whether to have students create characters based on the ones in Mo Willems’ books, create their own characters, or base characters on ones from other stories. We ultimately decided that since third grade was studying folktales as a part of their standards, we would weave together what we had learned from Mo Willems with a study of folktale storylines. In the classrooms, students read a variety of folktales checked out from our library and learned the many morals represented in the stories. While Mo Willems doesn’t explicitly give a moral at the end of his stories, many of his stories do offer life lessons. It was fun for teachers and students to make these connections between his books and the folktales read in class. After many stories, students decided which folktale they wanted to retell using their own character and setting interpretations. They took this idea with them to art. With the art teacher, students applied all of the techniques they had learned from analyzing the art of Mo Willems. They thought about versions of characters that they needed to make with varying expressions and whether or not to make a simple setting like Mo Willems does in most of his illustrations. The students worked on these in art class, and some students brought them back to the classroom to finish and use for writing. Students used the Puppet Pals app to record animated versions of their folktales. During writing workshop in the classroom, students used their characters, settings and background knowledge of their folktale to write their own version of their story. Each story had to include a moral. Some students chose to write the story out in narrative form, but many chose to write the story out as a script to perform. 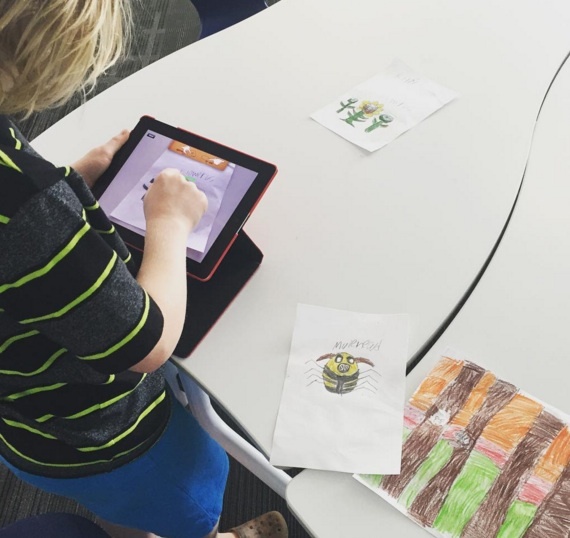 Writing a script prepped the students better for creating their final project in the Puppet Pals app. Students returned to the library to record their stories in Puppet Pals. I set up a schedule with 7 slots every 15 minutes. Students brought their characters, settings, and scripts. For the final project, we used the Director’s Pass version of Puppet Pals. This is a paid app, and it allows you to use your own characters and settings rather than use the ones from the app. Students had to take pictures of each character and setting in order to use it within the app. This was really the only step I had to show them since they had already done the other steps during their tinkering time. Then, they arranged all of their characters and settings on the screen to prepare for recording. After pressing the record button, students read their script, moved their characters around on the screen and switched out the scenes as needed. All movements and voices were being recorded throughout the process. Once students finished recording, we exported the video onto the camera roll of the iPad and put a sticky note on the iPad with the student’s name. There wasn’t time to upload the videos to YouTube while the students were there because of our tight schedule. Once students finished recording each day, I plugged each iPad into my computer and uploaded the videos to my YouTube channel. The sticky note helped me know the order and names on all of the videos. At the close of our project, the videos were live on YouTube for the world to enjoy. The teachers invited families to come into the school for Parent and Child Together (PACT) time to view the videos and share our incredible work together. You can see examples of some of the amazing work our kids created here: Janie, Noe, Parker, Chase, Everrett. I encourage you to look to Mo Willems and his whole collection of work for inspiration for projects like this one. His writing and art are full of potential for learning experiences for our students. For more great ideas on using Mo Willems books to inspire learning, check out Upstart’s Mo Willems Activity Guide, written by Matthew Winner. Andy Plemmons is a Google Certified Innovator and school library media specialist at David C. Barrow Elementary in Athens, GA. His library program is grounded in transliteracy, participatory culture and students as creators of content shared with the global community. He makes his work public through his blog. He can be reached on Twitter @plemmonsa and email.